Sixties’ America gave the world Jack Kerouac, Allen Ginsberg and a roster of other Beat poets. In Britain the Beat movement was altogether more sedate but in typical low-key fashion Britain did produce one truly outstanding counter-culture figure; Dom Sylvester Houédard, Benedictine monk, artist, poet, intellectual and theologian. Dom Sylvester Houédard, (or dsh, as he was known), was a contradictory and elusive figure whose work has been assiduously collected over the years by aficionados of Concrete Poetry and typewriter art. In a rare solo exhibition, Richard Saltoun Gallery has brought together a remarkable collection of his work, curated by Andrew Hunt, that covers the key years between 1963 – 1975. This first substantial presentation of the artist in almost five decades, aims to reinstate the importance of Dom Sylvester Houédard as a key figure of the counter-cultural and transnational art movements of the 1960s and early 1970s. Widely recognised during his lifetime as one of the leading theorists and outstanding practitioners of concrete poetry, dsh’s work, both as an artist and theologian, combined with his eccentricity, erudition and faith has made it impossible to place him in any single movement or clique. In the early 60s, dsh, was writing semi-confessional ‘neo-beat’ free verse. 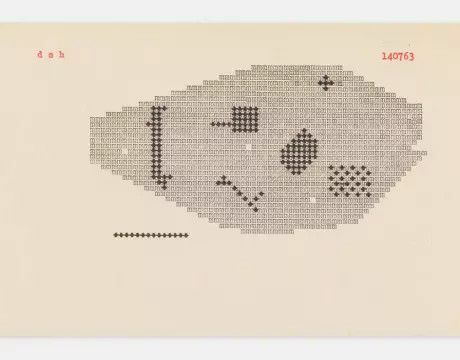 He was inspired by the Brazilian artist E.M de Melo e Castro, who described concrete poetry as ‘an experiment in ideogrammatic or diagrammatic writing and poetic creation’. Under this influence, Houédard started creating poems in which ‘words unsay themselves in a performative strategy of dis-ontology’. He quickly opened up the parameters of Concrete Poetry to include mail art, kinetic art, ‘part-art’ and performance art. Towards the mid ‘70s such was his fame that his presence became problematic for his monastery, not least because his connection with the prevailing revolutionary moment meant that he dealt also with politically and sexually explicit subject matter. Gradually, under pressure from the monastery, he turned to matters of theology and ceased his artistic practices. The exhibition at Richard Saltoun Gallery, showcases a comprehensive collection of typestracts that Houédard produced between 1963 and 1975 and aims to show how this complex man and artist deserves to be fully acknowledged as one of the leading influencers and visionaries of the British1960s cultural and artistic revolution. A monograph on Dom Sylvester Houédard, published for the occasion by Ridinghouse, will be available. The exhibition will present an evening of performances inspired by a selection of dsh’s Onomasticons and Typestracts. Curated by Nicola Simpson, researcher at Norwich University of the Arts. Date and performers to be announced.